Today, I’d like to show you a way to start a WordPress blog in 5 minutes. If you have tried before to install WordPress, choose a theme that works and set all the plugins you need, you know that it can be challenging. 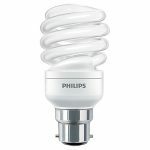 I write only about the tools I bought and use and this is why I am showing you the Internet Lifestyle Network WordPress Blog. I am very pleased with this blogging platform, which is very easy to use and very newbie friendly. There are videos explaining how to set-up the blog, but honestly it is so simple you don’t even have to watch them… In addition to the blog, you have with the ILN membership several fantastic Internet marketing courses and a great community to help you progress. Update: I am not using the ILN blog anymore, not because it is bad, but because I have my own self-hosted blogs. If you are a beginner and don’t want to go through the trouble of setting your own blog, the ILN blog is still a good option. After you have purchased your membership with the Internet Lifestyle Network, login into your account and click the “Create your blog” link. You will get on the Create Blog page. You may want to watch the video or get started right away. The first step is to select your blog address. 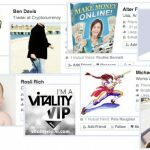 All members are on the internetlifestylenetwork.com domain and run their blogs with a unique sub-domain. 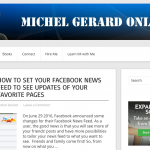 In this example I choose to use my name michelgerard.internetlifestylenetwork.com. You may use whatever you want as long as it is not taken. You have the possibility later on to buy a domain name in order to brand the blog better and map it to your blog. It is not necessary to get started. The second step is to type a short blog title that you can change later if you wish and then to select a template. It is recommended to use the first template, which is the ILN beginners & affiliates template and then customize it afterwards to fit what you want. Click the “Create Blog” blue button and voilà! When you click on the link you will see your blog. If you are an affiliate you can use the template as is, but if you are branding yourself or write articles about football or fitness, you can change everything. The header, background color, color theme, side banner, FaceBook widget and video can be changed and you can add more widgets at the side or bottom of the blog. You can do all the things you would normally do with a WordPress blog on your server. The only exception is that you can’t install your third-party plugins to keep the integrity of the network. If you click the “Next Step” blue button in the previous image, you will go to your dashboard. 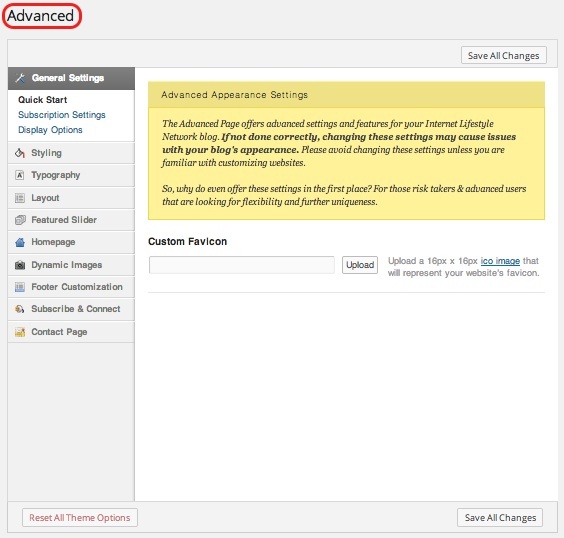 Circled in red, you can see the main sections available to work with your blog. You can also see that you have 1,000 MB of space allowed, which is enough for hundreds of posts. Let’s have a closer look at the menu. This is a simplified and re-organized WordPress menu and it is all you need to have a killer blog and concentrate on your content. The “Posts”, “Pages” and “Media” sections have the same sub-menus as an ordinary WP blog. 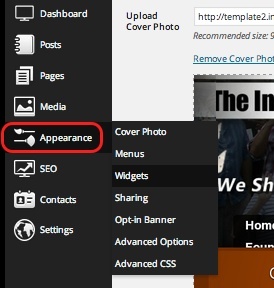 The “Appearance” menu is where you need to go to customize your blog. 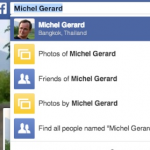 There you can change your “Cover Photo” (the header), modify your “Menus” and “Widgets”. I particularly like the “Sharing” options. 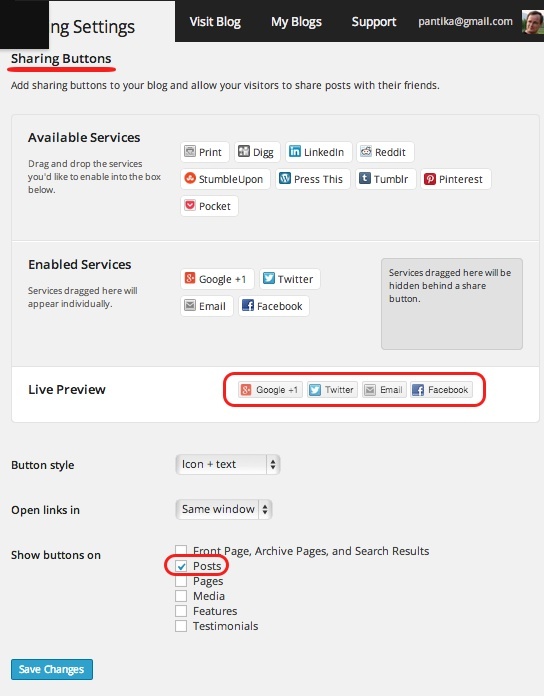 You can easily select the sharing buttons you can add to your posts. 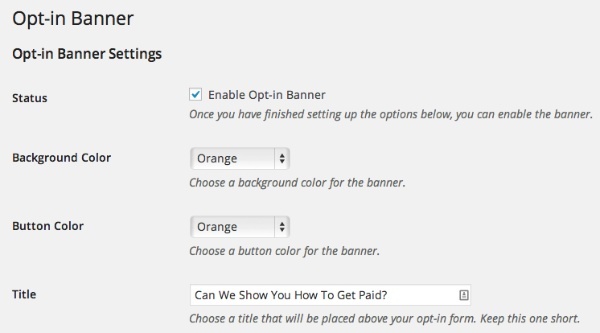 The “Optin-Banner” section is where you can enable or disable the opt-in form at the top of your blog. There you can connect you Aweber, GetResponse or any other auto-responder. 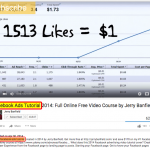 You can also embed any video you want. The “Advanced Options” section is for those who want to customize their blog even more as they would do on a self-hosted WordPress blog. 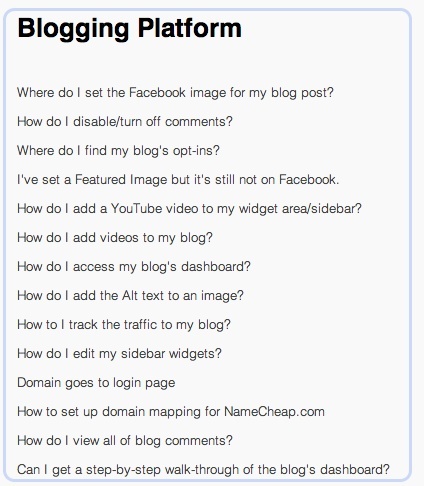 If you are new to WordPress, you’d better start blogging without paying attention to these options. Now let’s have a look at my favorite menu “SEO”. I was very pleased to see that the Internet Lifestyle Network has integrated the Yoast WordPress SEO plugin into their blogging system. This is the best SEO plugin available today and I am running it on this self-hosted blog. 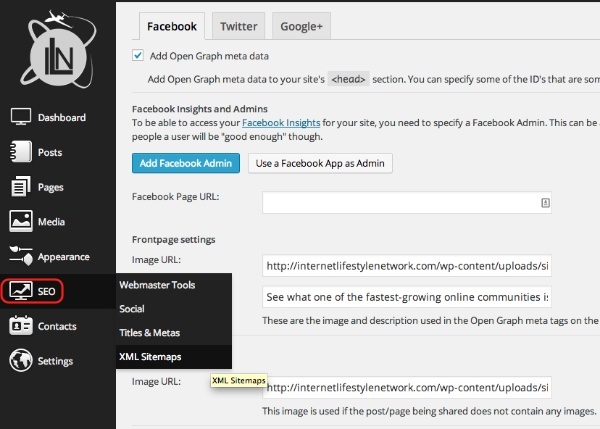 I am not going to detail every sections in this menu, but you have all you need to easily SEO optimize your ILN blog. The “Contacts” menu is where you can see the contact details of your leads that have signed-up from the top or sidebar opt-in banners. This is a lead I got just after a few hours setting-up the ILN blog with only one FaceBook status. 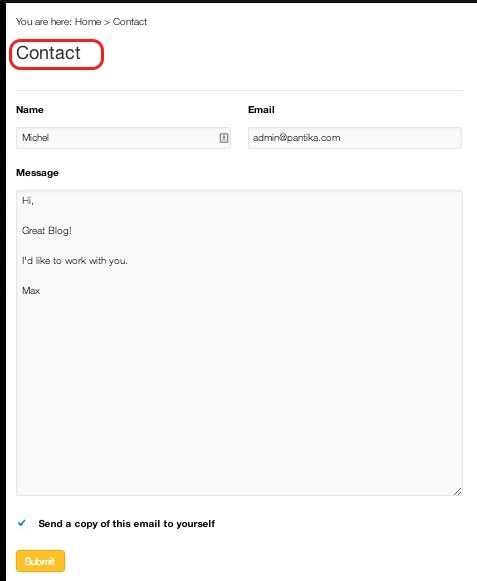 You can export all your contacts and send them emails individually if you wish. If you have set-up your own auto-responder, your contacts will be there too. If you are an ILN affiliate and enabled their auto-responder, your contacts will receive the company’s emails. The last menu is “Settings”. Here too, I am not going to detail all sub-menus but it is good to notice that there is an “Export” option that you can use if you wish later on to export all your blog content to a self-hosted WordPress blog. You are not tied to the Internet Lifestyle Network WordPress Blog forever. Now that I have finished showing you the different menus and options, I’d like to show you another killer feature in the ILN blog. Do you know how difficult it is to find the correct plugin to have a form that works on your blog? * Click above image to see the contact page or click here. With the Internet Lifestyle Network WordPress Blog, your web-form is ready to go. When someone fills in their information and their message, it is sent to you. And it looks formatted like this. Let me show you again how my Internet Lifestyle WordPress blog looks like after just 5 minutes of setting it up. And if along the way you need support, the Internet Lifestyle Network has 45 FAQ entries. Just like if it was not enough to create one blog, you can create multiple blogs on the Internet Lifestyle Network WordPress blog system. 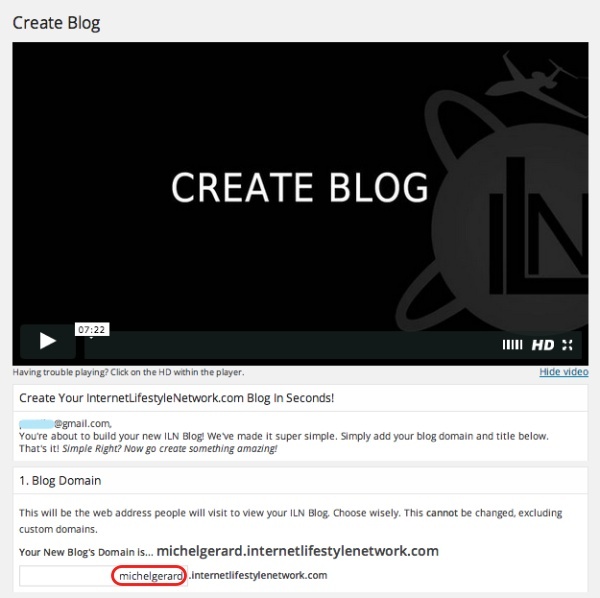 Just click the “Create Blog” link and repeat the process. I hope you enjoyed this Internet Lifestyle Network WordPress blog tour.